If you're looking for practical and stylish ideas for furnishing a child's bedroom, then Flair Furnishings High Sleeper beds fit the bill. With plenty of room for your child to grow, this contemporary designed range will suit any age, from younger children to teenagers, encouraging everything from imaginative play to studying for exams! For a younger child's bedroom, a high sleeper offers plenty of storage space for all those toys and the space under the bed can be anything from a spaceship to a cave. 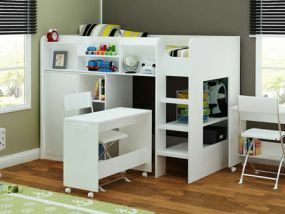 Add the optional desk unit and the high sleeper bed grows with them into their teenage years, providing a stylish and compact storage and study area - perfect for homework, hobbies and projects. If you add the storage option, the budding fashionista will have plenty of space to store their clothes - and, of course, a high sleeper bed is the ideal choice if your child's bedroom is tight on space. Available in bright white to suit any decor, these high sided high sleepers feature wide secure ladder rungs and will suit your adventurous child while keeping them safe and sound.